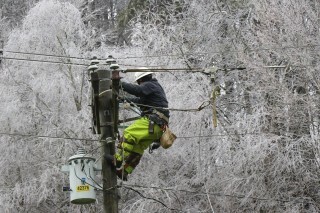 Blue Ridge Energy crews and over 100 additional line and tree technicians continue battling outages from overnight winds coupled with Thursday’s ice storm that have left nearly 4,000 members without power this morning. Currently without power at 5:30 am Friday are: 2,094 in Ashe County; 1,136 in Alleghany County; 587 in Watauga County; 73 in Wilkes County; and one Alexander County. Overnight winds coupled with Thursday’s ice storm left widespread damage, impacting thousands of Blue Ridge Energy members. The combination of trees weighed down by ice and high winds and falling onto power lines to cause outages also pose a safety danger: downed power lines can still be energized and therefore dangerous, even deadly. Blue Ridge Energy advises the public to stay away from downed lines and report them by calling 1-800-451-5474 or 911 immediately. Only a trained line technician working with the cooperative should go near a downed power line. The cooperative reminds members to report outages by calling 1-800-448-2383 or by using the Blue Ridge Energy mobile app. Outage updates are available any time on the cooperative’s live outage map at www.BlueRidgeEnergy.com or on the mobile app. Blue Ridge Energy thanks the 100 additional line technicians and contract tree crews assisting 75 Blue Ridge line technicians in a full force effort to restore power: Carter Tree Service, Sumter Utilities, Inc., Asplundh Tree Expert Co., Rutherford Electric Membership Corporation, EnergyUnited, Union Power Cooperative, Randolph Electric Membership Corporation, and Surry Yadkin Electric Membership Corporation.